He raises three children, teaches Chinese, and blogs all in record-breaking low temperatures. Mark met his future wife when he was studying in China in 2004. She was from Sakha-Yakutia, a Russian republic in the Far East famous for its extreme climate with the lowest temperatures in the Northern Hemisphere. They had been married for ten years and had two children when they made their mind in 2014: Mark was going to leave China and follow the rest of his family to Yakutia because his wife prefered that their children receive an education in her native Russian. The region is home for his wife, but alien to him. He did not know what to expect. "I was curious, nervous and a little afraid; I feared people might not accept me," said Babatunde. Yet, the black man, a rarity in Russia's Far East, gained popularity very fast. Locals took him fishing immediately after he arrived in the town. "It was not what I expected, it was very nice." An invitation to a local English club soon followed. "They invited me to join a seminar because English is an official language in Nigeria." It was by pure accident that Babatunde met the director of a school in a nearby village. The men talked and the school's director invited Mark to tour his institution. "I was at a school in a village and they said: will you be interested in teaching Chinese here?" 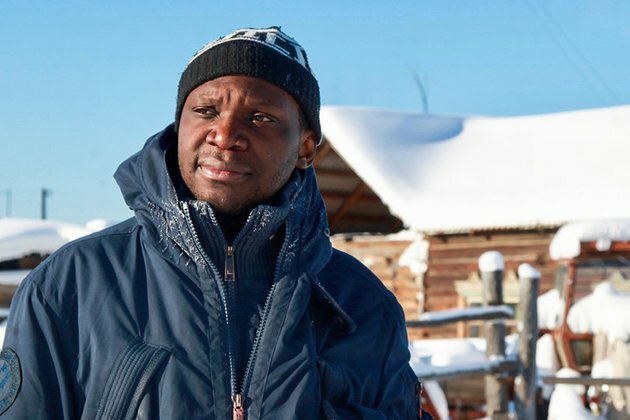 In a matter of days, the Nigerian found himself teaching Chinese in Russia's Far East. "I never expected anybody to hire me to teach Chinese there," said Mark. Yet, he was able to foster a deep connection to his pupils. "Most of my students have not traveled out of their region. They are very interested in China, Nigeria and about other countries," said Mark, who tried his best to educate the Yakut children about foreign lands. "My students are very intelligent, very well cultured, and have good manners. I relate to them as if they were my own children." Many things surprised Babatunde when he stepped foot on Russian soil. "The way houses are built (because it's very cold they build "legged" houses that are elevated off the earth's surface), the kind of food they eat: they can eat raw meat. I'm not sure I'll be able to get used to it," he said laughingly referring to traditional eating habits of the natives of the Russian North. Contrary to widespread belief, the extremely low temperatures of the region surprised the Nigerian much less. "I got used to the cold when living in China," said Babatunde. "Yet, -50C is not a joke, it's very serious. So, the way you dress is important and you have to get used to and understand the weather." Mark's fascination with his new home inspired him to launch his YouTube channel where he brands himself as "the northernmost African in the world." He indeed might be since the only video he uploaded so far shows him in a heavy winter coat wandering around frozen landscapes. Despite the attention the channel has received in the Russian media, the initial reason for launching it was more sentimental and personal. "When you try to tell people what Yakutia is they might not really understand. When you say it's -50C, they won't understand unless I record it on video and they can see it with their own eyes," said Babatunde. "I just wanted to do something small. I don't know for how long I am going to stay in Yakutia - I want to keep the memories." Click here to read about the lives of Africans in Tsarist Russia. If using any of Russia Beyond's content, partly or in full, always provide an active hyperlink to the original material. We've got more than 1,5 million followers on Facebook. Join them! Read more How did Africans prosper in Tsarist Russia?The African-American psychopath who sang the Soviet anthem and was crucified for it (VIDEO)3 foreigners who studied in Siberia and loved it5 territories that narrowly avoided becoming Russias coloniesWhy did the USSR lecture the U.S. on racial equality?